“Sources told CNBC that a potential tie-up between the storied chemicals behemoths would be structured as a merger of equals. “Older firms are increasingly controlling the largest market share in different sectors of the economy, according to a paper by the Brooking Institution’s Robert E. Litan and Ennsyte Economics’s Ian Hathaway. By 2011, the portion of U.S. businesses aged at least 16 years reached 34%, compared to 23% in 1992. Moreover, those mature companies went from employing only 60% of private-sector workers in 1992 to employing nearly three quarters of the private-sector labor force in 2011. The report attributes this trend to declining entrepreneurship, among other reasons. The rate of new business creation in the U.S. has been constantly shrinking in the past three decades. “The decline in new firm formation rates had occurred in every U.S. state and nearly every metropolitan area, in each broad industry group, and in all firm size classes,” the authors explain. Moreover, it has become more difficult for younger companies to survive and compete with the bigger ones. Business failures are more frequent and likely among start-ups, which may account for the fall in business creation after the 1990s. 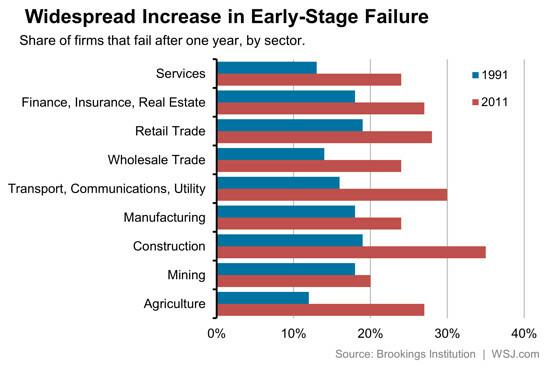 The economy has grown more advantageous for incumbent firms and less helpful for fledgling ones. The authors argue that younger companies are crucial to attaining a healthier economy as they have had the largest contribution to past “disruptive and thus highly productivity enhancing innovations” across different sectors ranging from airplanes and automobiles to computers and internet search. 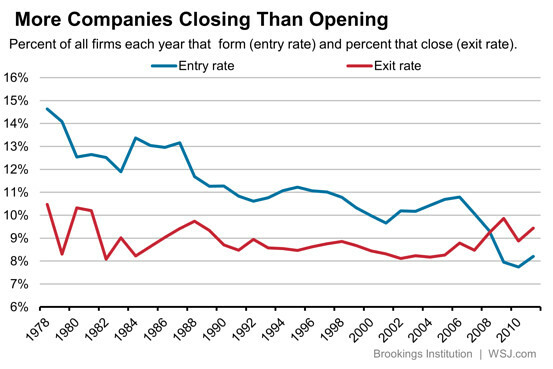 The first chart shows that more businesses close than open, which includes start-ups which fail. Nearly 90 percent of all businesses fail within 10 years. The second chart shows a specific breakdown by industry. This is not difficult to understand: new business face the inherent challenges of promoting a brand of a product or service in the face of well-established, existing brands. Why try something new when the old version works for you? Then you add in the high tax rates, high energy costs regulation compliance costs, all sorts of entry fees (examples include taxi medallions and occupational licenses), and new laws pushed by the old businesses, mainly larger firms, which drive out the smaller competitors who cannot keep up with the ever-increases taxes and regulations, and the result is that fewer and fewer people even consider starting up a new business, and those who do are more likely to keep the size small enough to handle the taxes and compliance requirements manage rather than spend energy trying to grown the business or make it more profitable. This is a significant reason why most of the new start-ups are companies which do not need a lot of energy use or space, such as a tech start-up where one only needs a computer with the right programming and internet access and which can be done from an apartment or coffee shop. The problem is that not everyone knows how to, or is capable of, learning to code and managing a computer-based business. On the downside there are fewer start-ups in other sectors of the economy like construction and manufacturing which can offer good-paying jobs needed for many working Americans. Start-ups provide people with job opportunities and can create new ideas which make civilization’s progress better for more and more people. Just imagine a world with no light bulbs, automobiles, or commercial internet access, for example. This is what cronyism does to the economy: it will enrich the well-connected and wealthy while making prosperity harder and harder for an increasingly few people. We are past the debate as to whether cronyism harms economic growth; the question is if and when the majority of people will recognize the problem and stand with organizations like CRI in opposing cronyism and the devaluing of the dollar.